One morning in Vrindavana, I was sitting in my house chanting my rounds when my disciple Narottam Das Thakur Das came to see me. He offered his respectful obeisances and then "Guru Maharaja," he said, "it's been a long time since I have visited Govardhana Hill. If you don't have any service for me today, I would like your blessings to go on Govardhana parikrama." "You're free to go," I said. "Just be back in time for the program tonight. I would go with you, but I have some important things to do." As he was leaving I had another thought. "Keep your eyes open," I said. "You never know what special mercy might come your way during parikrama in Vrindavana." Early the next morning he burst into my room as I was chanting my rounds. "Guru Maharaja," he said excitedly, "the most amazing thing happened to me yesterday." It seems that Narottam had taken a taxi to Govardhana Hill and begun his parikrama at Kusum Sarovara. He set a quick pace and reached the southern tip of the hill in a few hours. He felt tired, so he wandered into a forested area to take a short break.Suddenly he saw a sadhu sitting and chanting on japa beads. The sadhu was thin and lean, with matted locks tied neatly on top of his head, dressed only in a loin cloth with a chadar around his shoulders. His eyes were closed, and he seemed peaceful and equipoised, absorbed in his meditation on the holy names. Narottam went up to him. "My dear sir," he said, "may I ask who you are?" The sadhu opened his eyes. "I am the servant of Giriraja," he said. Narottam was attracted by the sadhu's saintly bearing, so he sat by him and began chanting. After thirty minutes the sadhu rose and turned to Narottam. "I am on Govardhana parikrama," he said. "Would you like to join me?" "Yes, of course," Narottam replied. They soon came to Apsara Kunda, a sacred lake at the foot of Govardhana and stopped for a moment to enjoy the beautiful scenery. "Where do you live, sir?" Narottam asked. "I live around Govardhana,"the sadhu said. "And each night I stay in a different asrama." "And how do you get food?" The sadhu smiled. "It's never a problem," he said. "No one goes hungry in Vrindavana. I beg from the villagers, and they always give more than I can eat. Usually I end up sharing my meals with the cows or the monkeys." At that moment they passed a group of pilgrims on a picnic. "Jai ho Babaji!" a man called out. "Please come take prasada with us." The sadhu smiled again. "You see?" he said. "Giriraja provides everything for His devotees." After having lunch with the other pilgrims, Narottam and the sadhu washed their hands in a nearby pond and continued walking. As they passed into an area of thick foliage, the sadhu gazed affectionately at Govardhana. "This hill, Giri-Govardhana," he said, "is the best devotee of Krsna. Radharani, Krsna's beloved, once said to Her friends: 'Of all the devotees, this Govardhana Hill is the best. O my friends, this hill supplies Krsna and Balarama, as well as Their calves, cows and cowherd friends, with all kinds of necessities - water for drinking, very soft grass, caves, fruits, flowers, and vegetables. In this way, the hill offers respect to the Lord. Being touched by the lotus feet of Krsna and Balarama, Govardhana Hill appears very jubilant.'" They walked only another fifty meters when the sadhu stopped. "Let me show you a special place where I sometimes go to chant," he said. They turned left off the parikrama path and made their way into the forest, then stopped just behind an asrama. The sadhu pointed to an opening in a rise on the ground. "Just over there is Raghava Pandit's cave," he said. "Raghava Pandit was a great devotee of Lord Caitanya and would do his bhajana in this cave whenever he visited Vrindavana. It is a very sacred place. Let us go there and chant at the entrance." While they were sitting near the cave chanting on their beads, Narottam turned to the sadhu. "Baba,"
he said, "how old are you? You're obviously not young, but you do have a youthful bearing." The sadhu chuckled. "I'm ninety years old," he said. "And do you spend much time here?" Narottam asked. "I've lived here my entire life," he said. "And I've done Govardhana parikrama every day since I was ten years old." Narottam was amazed. "That's every day for eighty years," he said. "How many Govardhana parikramas is that?" "The number is not important," the sadhu said. "When one circumambulates Govardhana Hill, the heart is purified and gradually one's devotion for Krsna is awakened." Narottam thought about the sadhu's words. Then he spoke. 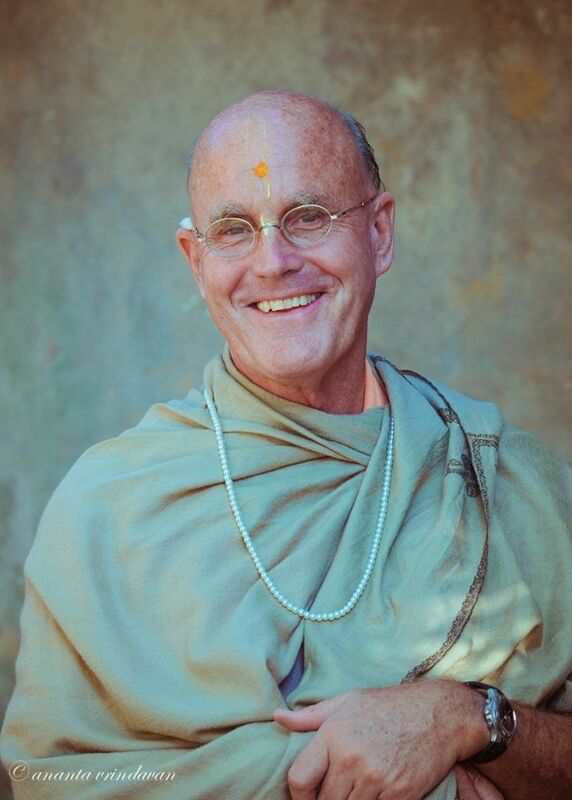 "My spiritual master," he said, "is a disciple of Srila A. C. Bhaktivedanta Swami, who left Vrindavana at an advanced age to spread love of Krsna all over the world." "I know of Swami Bhaktivedanta," the sadhu said. "My spiritual master is helping to advance his guru's mission," Narottam continued. "He tells people about the glories of Vrindavana in places like Eastern Europe and Russia. Every year during the month of Kartika he takes groups of devotees on parikrama around Vraja." The sadhu's eyes opened wide. "Oh that is very nice," he said. "And he carries a Govardhana-sila with him wherever he travels," said Narottam. The sadhu's eyes opened even wider. "That really is very nice," he said. As they continued chanting japa, Narottam studied the sadhu and noticed he was wearing two strings of large Tulasi beads around his neck. One consisted of dark-colored beads that appeared polished through years of being worn, and there was a large silver kavaca on it. The second set of beads was smaller and newer. Narottam suddenly had an idea. He took a deep breath. "Babaji Maharaja," he said, "I've noticed you are wearing two sets of large Tulasi beads around your chest." He paused for a moment. "Do you think I could have one to give to my guru as a present?" The sadhu stopped chanting and thought for several minutes. "Yes," he said, "I can give." Narottam was stunned. He hadn't expected the sadhu to give the beads. The sadhu put his chadar on the ground and then carefully placed his japa beads on it. He then removed the newer set of beads. "I carved them myself," he said as he dropped them into Narottam's hands. Narottam couldn't believe his good fortune as he looked at the beads, but when he looked up, he noticed the older beads now hanging in plain view on the sadhu's chest. The finely carved beads were made from knotted wood and appeared as if from another era. There was something mystical about them. "Babaji," Narottam said, almost pleading, "my spiritual master would be most appreciative of the older set." The sadhu's eyes opened wide. He fingered the beads. "I received this set from another sadhu forty years ago," he said. "He got them from his guru when he was a small boy, and his guru had received them from his own guru many years before that. They are more than a hundred years old." "They have circumambulated Govardhana Hill thousands of times, bathed in Radha Kunda every day I have lived here, and are imbued with the spiritual potency of all the prayers and mantras I have chanted in my appeals to Giriraja," said the sadhu. Narottam nodded and returned to his chanting. Then the sadhu spoke again. "But I will be happy to give them to your guru," he said. "Tell him to continue spreading the glories of Vrindavana wherever he goes." Then he took off the old Tulasi beads with the silver kavaca and carefully placed them into Narottam's trembling hands. Narottam sat staring at the beautiful necklace, a transcendental work of art permeated with the devotion of a saintly person. "But you must give me back the other necklace," the sadhu said with a chuckle. "What's a baba without beads?" Narottam handed back the newer set and placed the older one in his bag. "All right," the sadhu said with a smile, "let us continue our parikrama. Giriraja-Govardhana, ki jaya!" He stood up and began walking so quickly Narottam could hardly keep up with him. "This sadhu has so much energy," he thought. The sadhu's japa got louder as his pace increased, and after a while Narottam fell behind. Gradually the saintly person, intent on his daily ritual of circumambulating Govardhana, disappeared. Narottam stopped and checked in his bag to see if the sacred beads had really been more than a dream. "Gurudeva will be so happy," he thought. I sat in my room spellbound, listening to Narottam's story. He stopped talking and finally took out the beads and placed them in my hands. As I looked at them, I realized I had received a gift of unlimited mercy. I slowly placed them around my neck and turned to Narottam. "How do they look?" I asked. "Well, they're quite big, Guru Maharaja," he said. "Not what the general devotee wears." "Nevertheless, I must wear them," I said. "They are a gift from a saintly person. Besides, they're saturated with spiritual potency. I'm leaving for Brazil in a few days for a seven-week festival program. These beads will be my inspiration as I leave this holy abode of Vrindavana. I'll be carrying Vrindavana with me." "Yes," said Narottam. "The benediction was timely." As I studied the beads I asked Narottam what was in the kavaca. A look of embarrassment came over his face, and he blushed. "I forgot to ask," he said. "Huh?" I said. "You didn't ask the sadhu what was inside the kavaca?" "No, Guru Maharaja," he said. "I was overwhelmed by the moment." "That's all right," I said. "It adds to the mystery of the pastime. For sure, whatever is in the kavaca is spiritually potent and precious." I pressed the necklace close to my chest and then went back to chanting my rounds. "I will wear this sacred necklace for the rest of my life," I thought, "and one day, like the sadhu, I will pass it on to another devotee who will benefit from its charm." My mind went back to 1972, when Srila Prabhupada kindly handed me a dhoti from his suitcase. "A gift from a Vaisnava is a very special thing," he said. "It should be treated with all respect."